The battle and the balancing between old and new power will be a defining feature of society and business in the coming years. In this article, we lay out a simple framework for understanding the underlying dynamics at work and how power is really shifting: who has it, how it is distributed, and where it is heading. Old power models tend to require little more than consumption. A magazine asks readers to renew their subscriptions, a manufacturer asks customers to buy its shoes. But new power taps into people’s growing capacity—and desire—to participate in ways that go beyond consumption. These behaviors, laid out in the exhibit “The Participation Scale,” include sharing (taking other people’s content and sharing it with audiences), shaping (remixing or adapting existing content or assets with a new message or flavor), funding (endorsing with money), producing (creating content or delivering products and services within a peer community such as YouTube, Etsy, or Airbnb), and co-owning (as seen in models like Wikipedia and open source software). Facebook is the classic example of a new power model based on sharing and shaping. Some 500 million people now share and shape 30 billion pieces of content each month on the platform, a truly astonishing level of participation upon which Facebook’s survival depends. Many organizations, even old power players, are relying on these behaviors to grow the strength of their brands. For example, NikeID, an initiative in which consumers become the designers of their own shoes, now makes up a significant part of Nike’s online revenues. Funding behaviors typically represent a higher level of commitment than sharing and shaping. Millions of people now use new power models to put their money where their mouth is. The crowdfunding poster child Kiva, for example, reports that some 1.3 million borrowers living in 76 countries have collectively received more than half a billion dollars in loans. Peer-to-peer giving, lending, and investing models effectively reduce dependence on traditional institutions. Instead of donating via a big institution like United Way that parcels out money on donors’ behalf, people can support a specific family in a specific place affected by a specific problem. Platforms like Wefunder allow start-ups to access funding from thousands of small investors rather than rely on a handful of very big ones. One inventor just set a new record on Kickstarter, raising more than $13 million from 62,000 investors. To be sure, new power funding models are not without their downside: The campaigns, projects, or start-ups that are most rewarded by the crowd may not be the smartest investments or those that benefit the most people. Indeed, crowdfunding puts on steroids the human tendency to favor the immediate, visceral, and emotional rather than the strategic, impactful, or long-term. In the next level of behaviors, participants go beyond supporting or sharing other people’s efforts and contribute their own. YouTube creators, Etsy artisans, and TaskRabbit errand-runners are all examples of people who participate by producing. When enough people produce, these platforms wield serious power. Take Airbnb, the online service that matches travelers who need a place to stay with local residents who have a room to spare. As of 2014, some 350,000 hosts had welcomed 15 million people to stay in their homes. That’s enough to put real pressure on the incumbent hotel industry. Wikipedia and Linux, the open source software operating system, are both driven by co-ownership behaviors and have had a huge impact on their sectors. Many of the decentralized peer-directed systems Harvard Law professor Yochai Benkler calls “peer mutualism” belong in this category. Consider also an initiative that grew not out of Silicon Valley but out of a church in London. The Alpha Course is a template for introducing people to Christian beliefs. Anyone wishing to host a course can freely use its materials and basic format—10 meetings devoted to the central questions of life—with no need to gather in a church. Catalyzed by a model that empowers local leaders, the course has reached 24 million people in living rooms and cafés in almost every country in the world. What’s distinctive about these participatory behaviors is that they effectively “upload” power from a source that is diffuse but enormous—the passions and energies of the many. Technology underpins these models, but what drives them is a heightened sense of human agency. As new power models become integrated into the daily lives of people and the operating systems of communities and societies, a new set of values and beliefs is being forged. 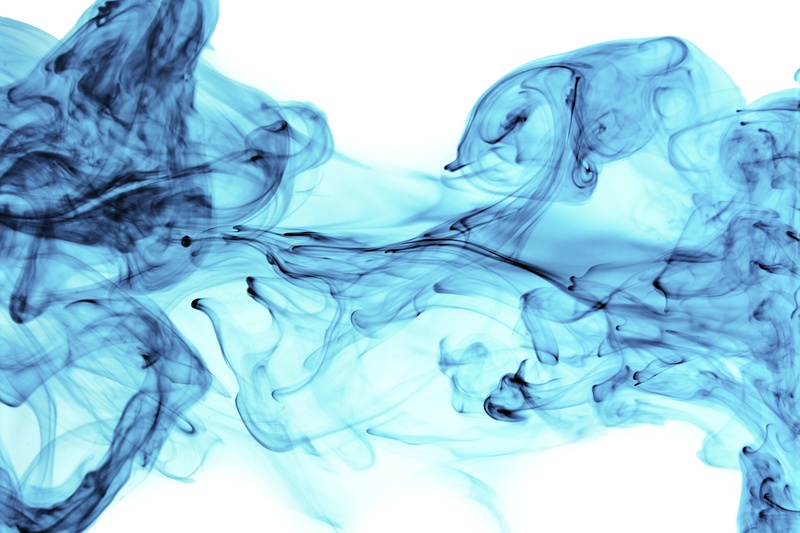 Power is not just flowing differently; people are feeling and thinking differently about it. A teenager with her own YouTube channel engages as a content creator rather than as a passive recipient of someone else’s ideas. A borrower on the peer-to-peer finance platform Lending Club can disintermediate that oldest of old power institutions, the bank. A Lyft user experiences consumption as a kind of sharing and subtly shifts his view of asset ownership. These feedback loops—or maybe we should call them “feed-in” loops, given that they’re based on participation—make visible the payoffs of peer-based collective action and endow people with a sense of power. In doing so, they strengthen norms around collaboration and make the case that we can do just fine without the old power middlemen that dominated the 20th century. Public polls reflect the shifting attitudes toward established institutions. For example, the 2014 Edelman Trust Barometer shows the largest deficit in trust in business and government since the survey began in 2001. New power favors informal, networked approaches to governance and decision making. The new power crowd would not have invented the United Nations, for instance; rather, it gravitates toward the view that big social problems can be solved without state action or bureaucracy. Often encountered in Silicon Valley, this ethos has at its core a deep and sometimes naive faith in the power of innovation and networks to provide public goods traditionally supplied by government or big institutions. Formal representation is deprioritized; new power is more flash mob and less General Assembly. New power norms place a special emphasis on collaboration, and not just as a way to get things done or as part of a mandated “consultation process.” New power models, at their best, reinforce the human instinct to cooperate (rather than compete) by rewarding those who share their own ideas, spread those of others, or build on existing ideas to make them better. Sharing-economy models, for example, are driven by the accumulated verdict of the community. They rely on reputation systems that ensure that, say, rude or messy guests on Airbnb have trouble finding their next places to stay. New power is also engendering a “do it ourselves” ethic, as Scott Heiferman, the CEO of Meetup, puts it, and a belief in amateur culture in arenas that used to be characterized by specialization and professionalization. The heroes in new power are “makers” who produce their own content, grow their own food, or build their own gadgets. New power proponents believe that the more light we shine, the better. Traditional notions of privacy are being replaced by a kind of permanent transparency as young people live their lives on social media. Clearly, the walls between public and private discourse are crumbling, with mixed consequences. And although Facebook profiles, Instagram feeds, and the like are often nothing more than a carefully managed form of self-display, the shift toward increasing transparency is demanding a response in kind from our institutions and leaders, who are challenged to rethink the way they engage with their constituencies. Pope Francis—the leader of an organization known for its secrecy—is surprisingly attuned to the need to engage in new power conversations. His promise to make the Vatican Bank more financially transparent and reform the Vatican’s media practices is an unexpected move in that direction. New power loves to affiliate, but affiliation in this new world is much less enduring. People are less likely to be card-carrying members of organizations (just ask groups like the ACLU that are seeing this form of membership threatened) or to forge decades-long relationships with institutions. So while people with a new power mindset are quick to join or share (and thanks to new power models, “joining” is easier than ever), they are reluctant to swear allegiance. This makes new power models vulnerable. New power is fast—but it is also fickle. Putting the two dimensions of models and values together yields a framework that helps organizations think about where they are now and also helps them chart their progress toward a more strategic position. New and old power values and models intersect in revealing ways. Plotting organizations along these dimensions sheds light on how companies are accumulating and wielding power. Occupy’s position in the Crowds quadrant, for instance, reflects its strong commitment to new power (though not necessarily its ability to compel change). 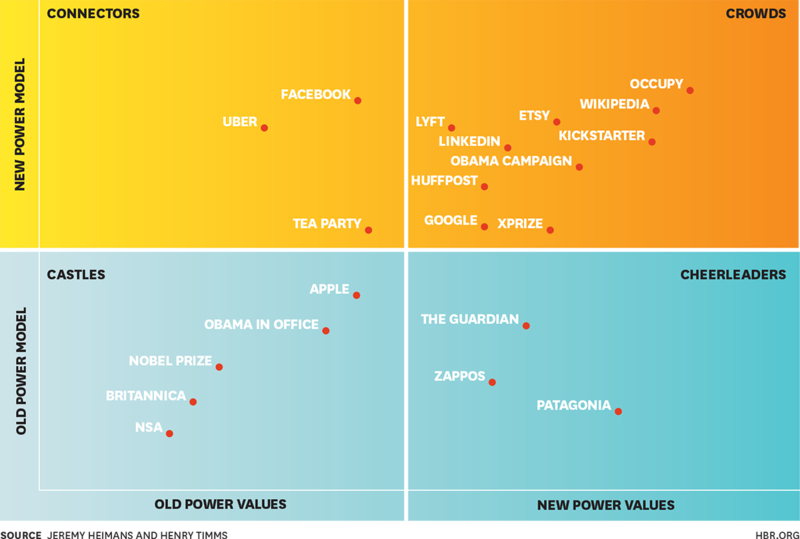 In the bottom-left quadrant are organizations that use old power models and have old power values. By our estimation, this category includes the world’s most valuable company—Apple—as well as some obvious dinosaurs. Apple’s success in the past 15 years can be chalked up to a terrifically executed strategy of cultivated exclusivity and pushing products from the top down. Unlike Google, Apple largely eschews open source approaches, and despite its antiestablishment fan base and the carefully managed “maker culture” of its App Store, it is renowned for secrecy and aggressive protection of IP. In the top-left quadrant are organizations with a new power model—for example, a network connecting many users or makers—but old power sensibilities. This category includes technology natives like Facebook, whose model depends on participation but whose decisions sometimes seem to ignore the wishes of its community, as well as organizations like the Tea Party, which has a strong, decentralized grassroots network but wields its influence in highly traditional corridors of power. Players in this quadrant tend toward “smoke-filled room” values while relying on a “made by many” model (and many run an increasing risk by doing so). In the bottom-right quadrant are organizations that use old power models but embrace new power values. Patagonia, for example, has a traditional old power business model, yet it stands out for its embrace of new power values like transparency. Some of these “cheerleader” organizations, such as The Guardian newspaper, are working to evolve their positions so that they not only espouse new power values but incorporate new power models effectively. In the top-right quadrant are the “purest” new power actors. Their core operating models are peer-driven, and their values celebrate the power of the crowd. This is where we find established peer-driven players, like Wikipedia, Etsy, and Bitcoin, and newer sharing-economy start-ups, like Lyft and Sidecar. This quadrant also includes distributed activist groups and radically open education models. Some organizations have moved from one quadrant to another over time. Think of TED, the organization dedicated to “ideas worth spreading.” Ten years ago, the organization talked the talk on collaboration and networks, but in reality it lacked any kind of new power model—it was simply an expensive, exclusive, and carefully curated annual conference. Since then, TED has broadened its model by enabling self-organization and participation via the TEDx franchise and by making its previously closed content open to everyone. Both decisions have had a major impact on the scale and reach of the TED brand, even as the organization has grappled with risks associated with loosening control. TED is now effectively leveraging a complementary old power and new power business model. Most organizations recognize that the nature of power is changing. But relatively few understand the keys to influence and impact in this new era. Companies see newly powerful entities using social media, so they layer on a bit of technology without changing their underlying models or values. They hire chief innovation officers who serve as “digital beards” for old power leaders. They “reach out” via Twitter. They host the occasional, awkwardly curated, lonely Google hangout with the CEO. But having a Facebook page is not the same thing as having a new power strategy. If you’re in an industry that is being radically altered by new power, it isn’t enough to add some window dressing. A newspaper business, for example, can’t simply insert a comments section at the bottom of every article online and call that new power—it has to intentionally build reader engagement and a vibrant community, which almost certainly will require shifts in both its model and its values. The New York Times is struggling with exactly this dilemma, as its leaked innovation report last year demonstrated. Traditional organizations that want to develop new power capacity must engage in three essential tasks: (1) assess their place in a shifting power environment, (2) channel their harshest critic, and (3) develop a mobilization capacity. A telling exercise is to plot your organization on the new power compass—both where you are today and where you want to be in five years. Plot your competitors on the same grid. Ask yourself framing questions: How are we/they employing new power models? And how are we/they embracing new power values? To understand how your organization is deploying new power, consider which participation behaviors you are enabling. This process starts a conversation about new realities and how your organization needs to respond. It doesn’t always lead to a resolute determination to deploy new power—in fact, it can help organizations identify the aspects of their core models and values that they don’t want to change. There’s a good chance that your organization is already being occupied, whether you know it or not. Websites are popping up that provide forums for anonymous employee accounts of what is really going on inside businesses and how leaders are perceived. In our new power world, the private behavior—and core challenges—of every organization is only a leak or a tweet away. This poses a threat to happily opaque old power organizations, which face new levels of scrutiny about performance. Are you really delivering advertising reach for my product? Are you really improving my kid’s reading skills? Today, the wisest organizations will be those engaging in the most painfully honest conversations, inside and outside, about their impact. Old power organizations need to do more than just look inward; they also need to think differently about how they reach out. Organizations that have built their business models on consumption or other minimal participation behaviors will find this challenging but increasingly important. Organizations that rely on new power can be easily intoxicated by the energy of their crowds and fail to recognize that to effect real change, they too might need to adapt. They should bear three essential principles in mind. Respect your communities (don’t become the Man). If old power organizations should fear being occupied, new power organizations should fear being deserted. Those who deploy new power models but default to old power values are especially at risk of alienating the communities that sustain them. This isn’t simply a problem of mindset, where organizations lose touch with the crowds that made them prosper. It is also a practical challenge: The expectations of critical stakeholders—investors, regulators, advertisers, and so on—often run counter to the demands of new power communities, and balancing those agendas is not easy. The rise of Uber, the ride-sharing service, is a study in new power. Uber has built an extraordinarily fast-growing and dense transport network without any physical infrastructure at all. The service relies on peer coordination between drivers and passengers, enabled by sophisticated software and a clever reputation system. Passengers rate drivers, but drivers also rate their passengers—building trust and promoting good behavior without the need for a more onerous rules-based system. Uber’s business model depends almost exclusively on its relationship with its network participants (drivers and riders). That relationship is now at risk because of a misalignment between Uber’s new power model and its old power values. For example, anticipating a future of driverless cars, CEO Travis Kalanick noted early this year, “Once we get rid of the dude in the car [the driver] Uber will be cheaper.” This understandably infuriated many Uber drivers, and in some cities they are unionizing because they perceive the company to be exploitative. (By contrast, Airbnb has rallied its hosts into a grassroots army of defenders against skeptical regulators.) Making matters worse, Uber is also tussling with its customer base, which it badly needs to keep on its side, over its surge-pricing model. Uber defends the model as rational and efficient, but some see it as a breach of faith, and new power competitors like Lyft are using this mistrust to drive a wedge. With its community-centric brand proposition “your friend with a car,” Lyft is claiming a closer alignment between its new power model and new power values. As Uber scales up, it faces further challenges. After raising $1.2 billion from investors in 2014, it is now under considerable financial pressure to generate surpluses by concentrating power and sharing less value with drivers and consumers who feed the model. At the same time, old power is firing back. In London and Paris recently, taxi drivers went on strike to protest Uber’s policies and the government’s failure to regulate ride sharing effectively. French authorities have tried to restrict Uber by proposing a minimum 15-minute wait for any person who requests a car, giving taxi drivers a head start. How will new power players respond to regulatory challenges? For now, the most effective responses will involve a potent combination of old and new power—that is, a traditional lobbying strategy combined with a capacity to mobilize network participants. Uber’s recent hiring of David Plouffe, a mastermind of President Obama’s new power electoral strategy, suggests that the company understands what it is up against. Facebook, like many organizations with a new power model, is dealing with this tension between two cultures. Facebook’s old power corporate ambition (more data ownership, higher stock values) clashes with the demands of its own crowd. Initial surges of interest in alternative social networks promising to honor new power values may be a sign of things to come. As new power concepts of digital rights evolve, these conflicts will most likely increase. For all new power’s progress, it is not yet making much of a dent in society’s old power superstructure. Khan Academy is the darling of the digerati, but our education systems remain largely unchanged, with school timetables still built around family lifestyles of the 1800s. Lawrence Lessig, a leading new power thinker, wants to overhaul campaign finance laws in the United States, but he has realized that the best way to “end all super PACS” is with a super PAC. In this context, the right strategy for the moment is often to go “bilingual,” developing both old and new power capacities. Arianna Huffington, for example, has built a platform that comprises a network of 50,000 self-publishing bloggers, but she also skillfully wields an old power Rolodex. Bilingual players like Huffington deploy old power connections to get what they need—capital, legitimacy, access to partnerships, publicity—without being co-opted or slowed down. They use institutional power without being institutionalized. New power models will always have limited influence and impact unless they are operating within a superstructure designed to play to their strengths. Take the global grassroots movement Avaaz. Even though it has 40 million members, it will only get so far in its efforts to effect change if the decision-making mechanism that it seeks to influence is an entrenched old power structure like the UN climate negotiation process. New power makes for great campaigns and stirring protests. Populist movements and uprisings of recent years, especially the Arab Spring, vividly demonstrate new power at work. But new power has not yet proved capable of effectively influencing the business of government. It surges but often dissipates quickly, leaving old power to reclaim the advantage. The 2008 Obama campaign was a master class in how to use new power tools and how to tap into new power values (“Yes We Can!”). After the victory, however, things changed significantly. The campaign transitioned into government, but its massive grassroots base largely did not. The old power realities of government and the deep-rooted superstructure of rules and procedures were simply not designed for—and would not bend easily to accommodate—new power. New power faces two big challenges in influencing government. First, old power is solidly entrenched and well protected. Second, the loose, unaffiliated nature of new power makes it hard to focus. New power is good at big statements, the coin of elections, but bad at small details, the coin of government. The Occupy movement flared up and then faded for this reason, lacking a clear strategic direction beyond its initial call to arms. To truly transform government, new power will need to do more than change the short-term political dynamics—it must change the rules of the game. Early experiments, such as participatory budgeting, community activism initiatives likeSeeClickFix.com, and Iceland’s crowdsourced process of building a new constitution, are attempts in this direction, but none has yet proved capable of fundamentally shifting the operating system of government. The battle ahead, whether you favor old or new power values, will be about who can control and shape society’s essential systems and structures. Will new power forces prove capable of fundamentally reforming existing structures? Will they have the ingenuity to bypass them altogether and create new ones? Or will they ultimately succeed in doing neither, allowing traditional models of governance, law, and capital markets to basically hold firm? Too often, new power bosses dream only of a good “exit” from a hot business, but we need new power leaders to make a grand entrance into civil society. Those capable of channeling the power of the crowd must turn their energies to something more fundamental: redesigning society’s systems and structures to meaningfully include and empower more people. The greatest test for the conductors of new power will be their willingness to engage with the challenges of the least powerful.